Here are pdf notes of novel Goodbye Mr. Chips for 2nd year students. These are chapter wise short questions answers of English F.Sc and F.A part 2. Zahid Notes provides all type of guess papers, for class 1st year, 2nd year, 9th class, 10th class, for all subjects like physics, chemistry, biology, computer, Urdu, English, maths, and all other subjects. You can download PDF Notes for second year and F.Sc part 2 and F.A Part 2 students. Once Goodbye Mr. Chips is a famous novel by James Hilton. The writer has sketched the life of an old man called Mr. Chips. His full name was Mr. Chippings but commonly called MR. Chips. He was an oldfashioned conservative teacher. Below is the list of all chapters of the novel Goodbye Mr. Chips . 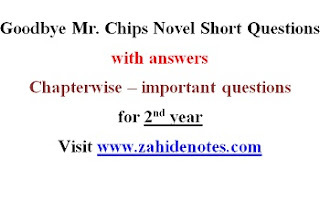 Please read and download all chapters important short questions answers for Goodbye Mr. Chips novel.